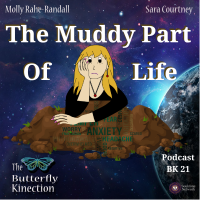 Molly and Sara have a candid discussion about the muddy part of life. As we learn to focus on ourselves and what we truly want to be doing, sometimes junk or mud can get in the way and we can become stuck and unable to move forward in our own soul growth. This junk or mud can be anxiety, fear, negative thoughts, annoyance, or frustration. We may try to set an intention for things to go a certain way and get frustrated when it doesn’t work out the way we would like. However, we need to remind ourselves that we are strong, and that we can overcome anything, even if there is a mud slide coming that we don’t want to deal with. No matter how negatively we are feeling, we can get through the mud and clean it off because we can do anything we set our mind to. Molly and Sara share their experiences with anxiety and how it affects their lives and their ability to put themselves first. They also give some insight into how they work through their anxiety. It is important to remember that we must honor where we are at, even on the bad days when we feel like we have gotten nothing accomplished. Honoring ourselves isn’t just in how we succeed, it’s how we choose to honor our feelings (good or bad) so that we can work through it and get out of our muddy place. 14:15- Sara talks about her facebook group “Dragon Warriors: Conquering the Fear and Anxiety within.” It is a support and educational group in which she would like to create a safe place for people to feel comfortable talking about their anxiety. The dragon is the warrior within us, and the support system we can and need to give ourselves. We are all dragons, learning that the strength is within us. Even in our deepest darkest moments, we are never alone. We have the most amazing team to support us. Our family, friends, angels and guides, and Source are here to help us get out of the mud. They will also help us to find the humor in things. If we look for the moments that bring laughter, it will help melt the negativity away and shift how we are feeling. We will always be learning and growing even in the muddiest parts of life. Look for Soul Reflections Academy on our website and sign up for our Free Soul Reflection Challenge. A new challenge “The Muddy Part of Life” will be posted! For more of The Butterfly Kinection, follow us on Facebook, Instagram, Pinterest and our website. To receive information on special offers, new products, upcoming podcasts, new classes, or our newsletter, subscribe to our email list HERE!